Easter’s a wonderful time to see family, anticipate spring—and talk about some great examples of Easter candy packaging. Like most holidays and events, candy brands are strutting their stuff with eye-catching and original packaging for their chocolate. Since we’re always game to overload on sugar and sweet packaging, here’s 6 hopping examples of our favourite Easter candy packaging. We’ve all seen (and enjoyed) gummy bears, both the regular versions and their giant-sized cousins. 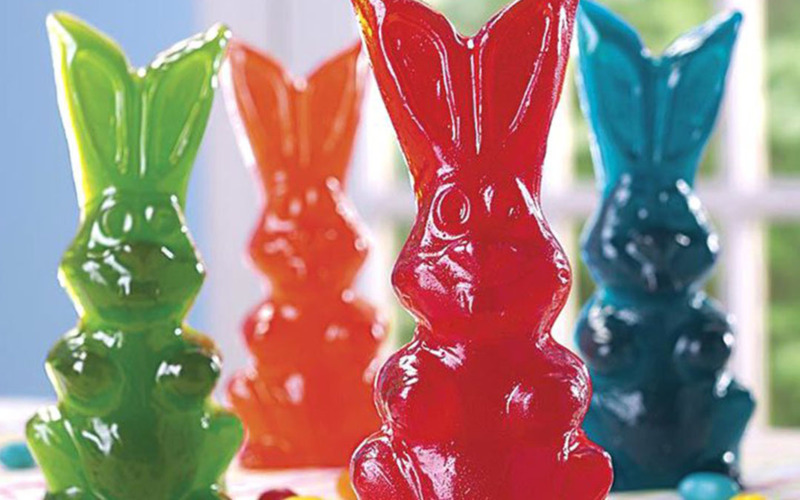 But how many of us have had the joy of seeing a giant gummy rabbit? 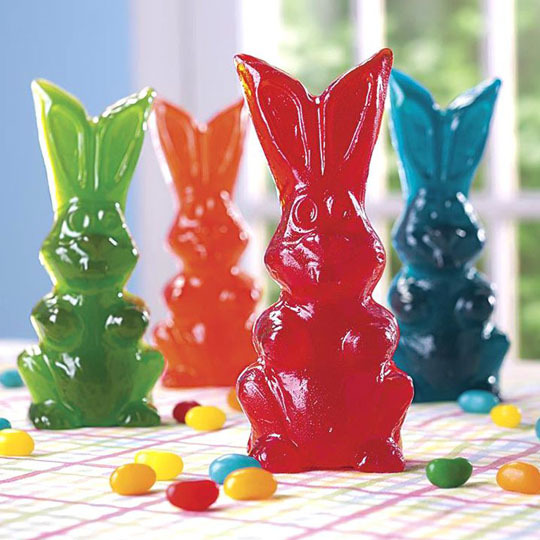 These guys are 3/4 -pounds of gelatin flavoured in apple, blue raspberry, fruit bubblegum and cherry. While they’re not exactly Easter candy packaging, we do think they’re quite the candy/sugar delivery system. A mainstay in our candy packaging blogs, M&M’s never misses the mark. 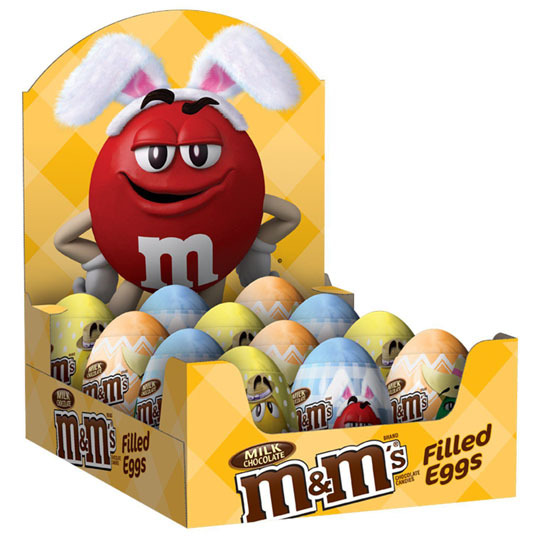 As part of the tradition to find Easter eggs around the house, M&M’s has stuffed bags of candy inside decorated eggs and offered themselves up for delicious consumption. Supported by an egg crate insert, the eggs are arranged just like real ones would be. Plus, Red’s wearing a headband with bunny ears. That’s a win right there. The most unique candy on this list comes from one of the most unique chocolatiers out there. 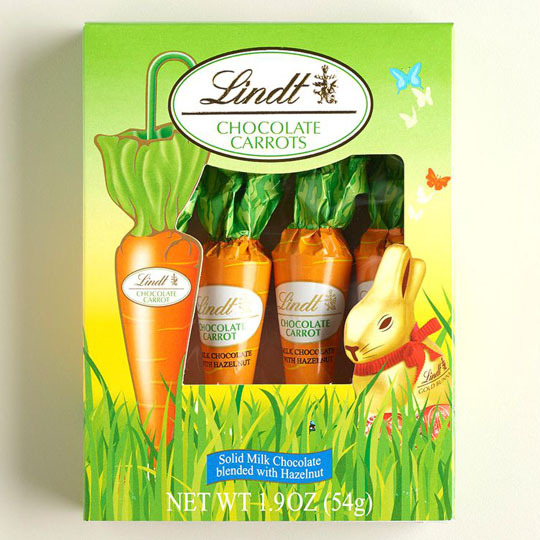 Instead of shaping their delicious products in egg or bunny shapes, Lindt’s taken a lateral step and formed their chocolate-and-hazelnut treat into a carrot, complete with carrot-theme wrapping. It’s a great piece of packaging and advertising, saying our chocolate is so delicious, even the Easter bunny prefers it. This might actually turn us vegetarian. At least, temporarily. These guys are classic, and their colour choices are fast becoming legendary. As one of the most popular Easter candy options, Peeps know their audience well, displaying each grouping of chicks like they’re ready for what’s coming. 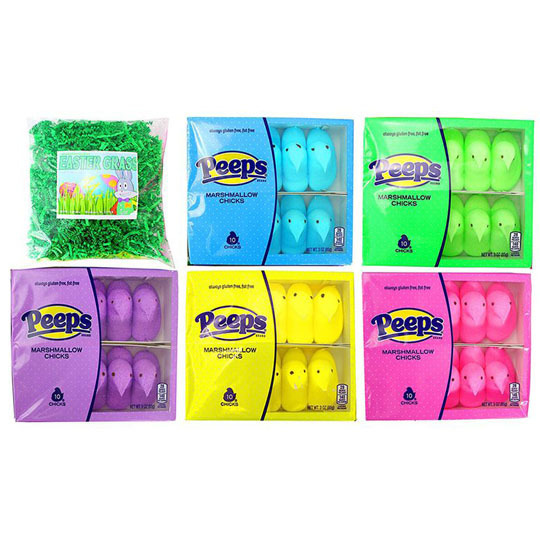 Each pack comes with paper grass for the perfect Easter-themed presentation, ensuring die-hard ‘Sugarvores’ will devour these neon peeps with abandon. They’re not as popular here as they are elsewhere in the world, but Swedish Fish still delivers on great Easter candy packaging. 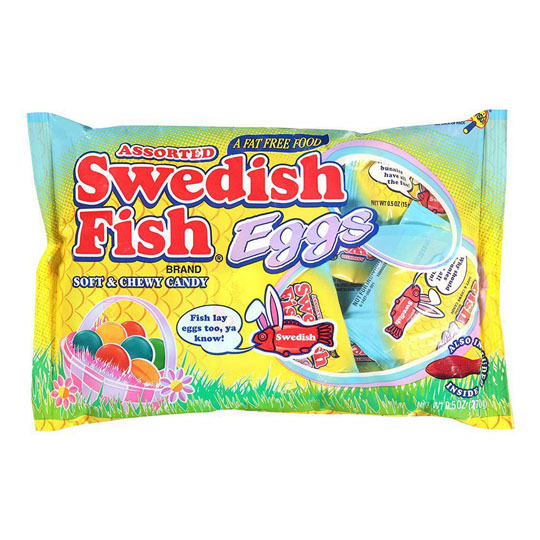 Swedish Fish Eggs seems like such a no-brainer choice, but it’s still surprising and super endearing. Seeing fish wear bunny ears will never not be cute, and the smarmy “Fish lay eggs too, ya know!” has to make anybody crack a smile. This is smart, clever packaging. Though it might be surprising to receive, this is one egg crate anyone will be thrilled to open. 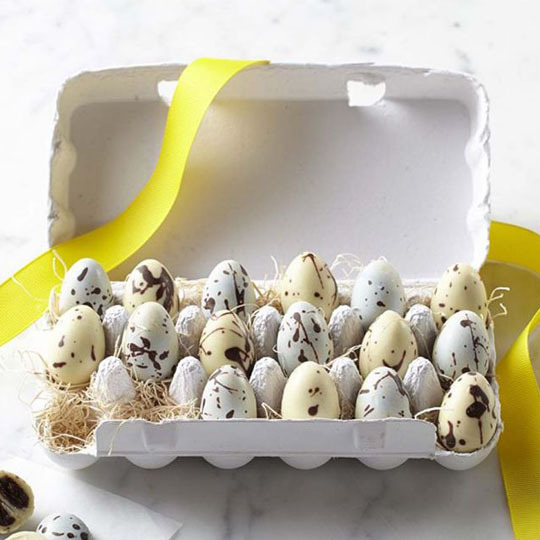 Eggs are a common choice for Easter candy, but speckled, nearly true-to-life bird eggs has to be one of the most interesting and unexpected ways to present Easter candy packaging. Williams Sonoma never falters on the presentation front, and this Easter treat keeps up the tradition. The white quail eggs are filled with hazelnut ganache and the blue robin eggs have butter caramel filling. It’s upscale, unexpected, packaged wonderfully and presented perfectly. We love seeing brands of all types have fun with packaging, and seeing all this Easter candy packaging has us smiling and our stomachs rumbling. What’s your favourite Easter candy? Let us know your opinions—and if there’s any candy packaging in general that you love, we’d be thrilled to showcase it. Happy Easter, everyone!